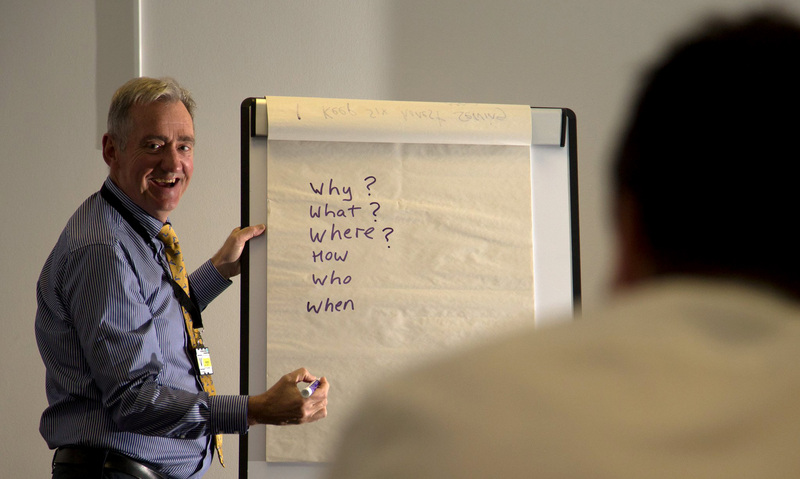 White Hart Director John Brooks has delivered our media, presentation and communication training for more than 25 years. He recently worked with EEF to deliver an incident management training day, incorporating media interventions and media training, for Tideway East (Costain/Vinci/Bachy Soletanche). Previous clients include Laing O’Rourke, Swansea University, Welsh Water, Western Power Distribution, Wales and West Utilities, and Hyder Consulting. With his experience as a print, radio and TV journalist reporting on crisis events he has been well-placed to help organisations prepare procedures for dealing with enquiries and media contact, to help individuals understand those procedures and their role in delivering them, and to prepare individuals to act as spokespersons. We often work one-to-one with individuals who need to improve their communication skills including Board Directors, or in groups of 4,6,8 up to large audiences or classrooms. Training is tailored to company, audience and individual needs. The difference between live and recorded, in different settings. Courses start at introductory level to raise awareness of the importance of good PR and everyone’s role in supporting the preparation of media interactions. Through these sessions we help organisations identify individuals who have an aptitude for media work and prepare them to represent their organisations through more advanced intermediate and advanced sessions.